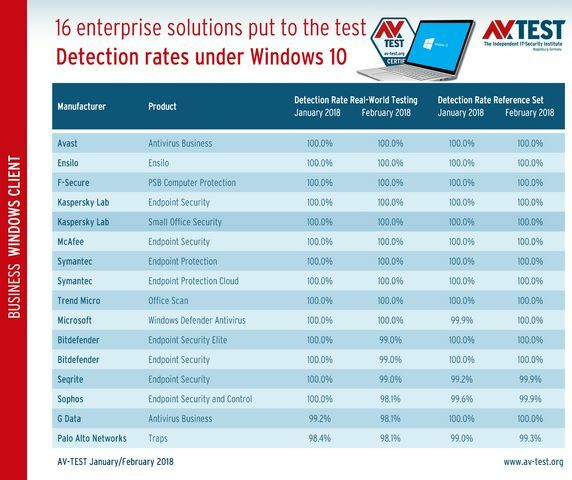 For the protection of corporate networks, the laboratory of AV-TEST tested 16 solutions under Windows 10 in terms of their protection, performance and influence on usability. Many of the products achieved very high scores. The acceptance and use of Windows 10 continue to increase unabated. In Europe and the United States, the use of Windows 10 is ever increasing, approaching 60 percent, whereas Windows 7 will soon decline to below 30 percent. The remainder is made of up Windows 8.1 and older systems. 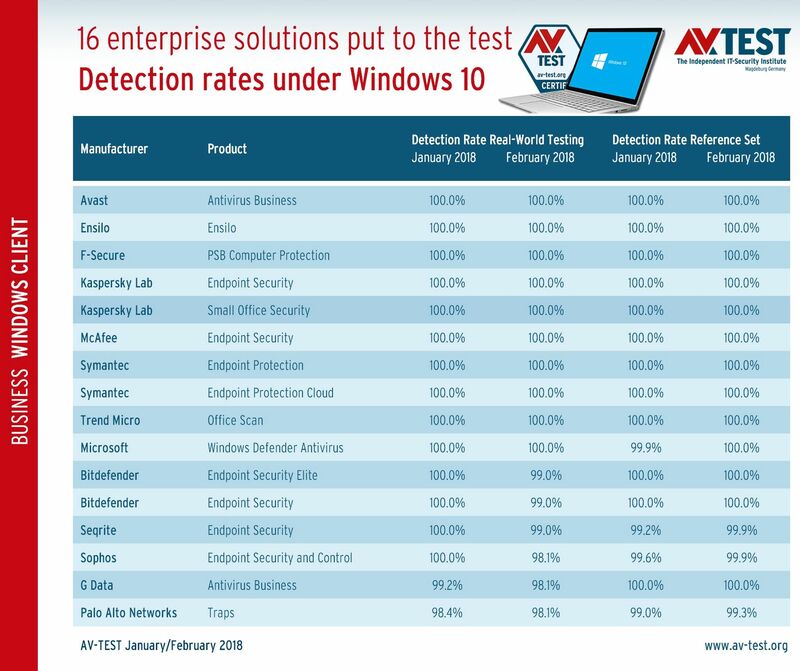 That is why in January and February 2018, AV-TEST tested 16 client-server solutions under Windows 10. All test scores were determined per month in three test categories: protection, performance and usability. For each category, the laboratory awards a maximum of 6 points, thus up to 18 points overall. If a product reaches 17.5 or 18 points, it then earns additional recognition as a TOP PRODUCT. Many products demonstrated superb performance in the current test. The solutions from Kaspersky Lab Symantec (with two products each), Trend Micro and Bitdefender achieved exceptional scores. They earned 18 and 17.5 points respectively and gained TOP PRODUCT recognition. 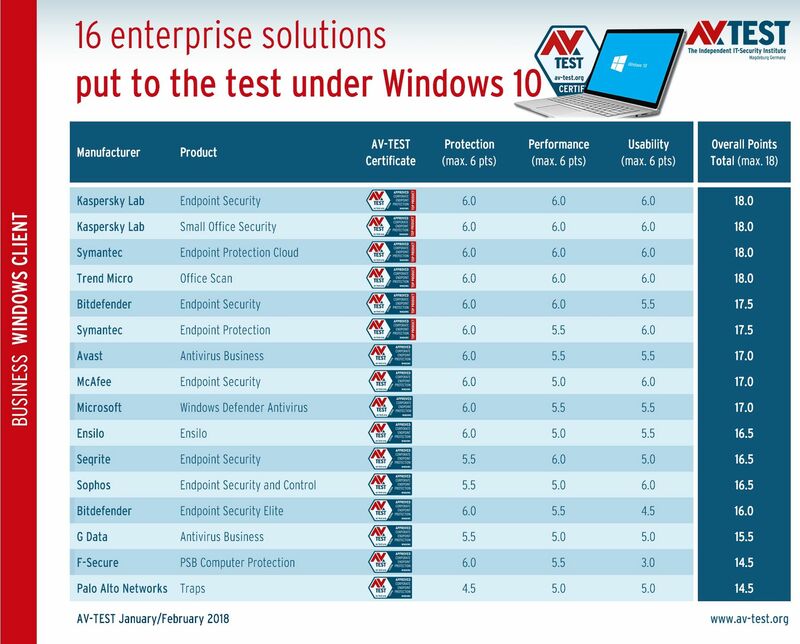 The products from Avast, McAfee, Microsoft, Ensilo, Seqrite and Sophos completed the test with excellent scores of 17 and 16.5 points respectively. The second product from Bitdefender received 16 points. The solutions from G Data, F-Secure and Palo Alto Networks still managed to score 15.5 and 14.5 points. Some products provided flawless protection, yet exhibited minor weaknesses in terms of performance and usability. For 6 of the 16 client-server solutions, there was special recognition as TOP PRODUCTs. A total of 9 products detected all of the more than 10,000 malware samples used in the test. Both products, Endpoint Security and Small Office Security, achieve the maximum 18 points – two TOP PRODUCT ratings. The cloud version of the corporate solution received a TOP PRODUCT rating with 18 points. A top evaluation was awarded for flawless detection, good performance and usability: 18 points and TOP PRODUCT. If we only focus on the test's detection scores, then the result is excellent. Overall, 9 out of 16 solutions tested aced the test in all four components. The real-world test and the test with the reference set were carried out both in January and in February. That is why the table also indicates four test scores. In the real-world test, the products faced off against 440 of the latest malware samples, freshly obtained from malicious websites or emails – so-called zero-day malware. On the reference set, the laboratory uses nearly 10,000 known malware samples that are a maximum of 2 weeks old and therefore ought to be known to the products. Whereas 9 security solutions completed all the tests error-free, 3 products each in one of the categories committed only one minor error. That is why 12 out of 16 security solutions received the maximum point score of 6. A very considerable feat. In corporate computing, the performance of existing office PCs is usually limited. That is why the resources required by a security solution are an important indicator. The laboratory tests how much performance a system loses with an active security product if it is copying data, launching applications, opening websites and more. The tests are run on both a standard and a high-end PC. Once with and once without security system. The results of the test series are excellent. 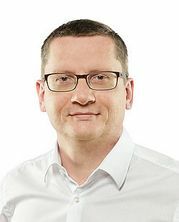 6 products placed virtually no load on the system, and for this they were awarded 6 points: Bitdefender Endpoint Security, Kaspersky Lab (both products), Seqrite, Symantec Endpoint Protection Cloud and Trend Micro. 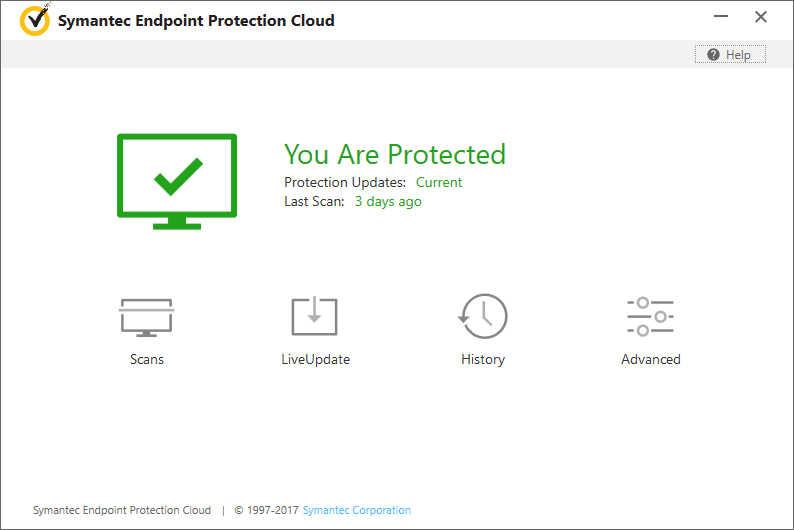 Still achieving quite good results of 5.5 points were the solutions from Avast, Bitdefender Endpoint Security Elite, F-Secure, Microsoft and Symantec Endpoint Protection. Generating a greater, but still not a high load, on the client were the products from Ensilo, G Data, McAfee, Palo Alto Networks and Sophos. Their performance still earned a solid 5 points. Any incidence of a false alarm triggered on a client by a security solution is one too many. After all, incidents such as these are unsettling to the user and cause increased overhead for the administrator of a company. The lab subsumes all false positives and alarms under the category of usability. In the test, 500 websites were visited with the security software activated, 1.5 million normal files scanned and several dozen programs installed and launched. In none of these tests was there any danger, therefore the security solutions should not have sounded any alarm. For the tests with the websites, this was the case for each product. 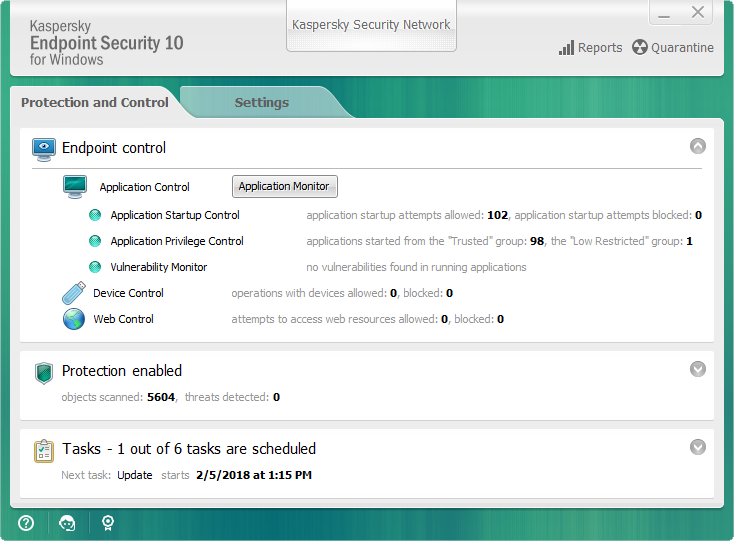 There were initial difficulties on the program installations and launches: Bitdefender (Elite Version) blocked 4 applications, F-Secure even blocked 8. The programs from Seqrite, Sophos and Symantec (both versions) only committed one mistake each. For the scans of the 1.5 million harmless files, there were only minor detection errors on some of the packages. For 7 corporate solutions, the error rate was at zero or only indicated one false positive: Kaspersky Lab (both products), McAfee, Symantec (both products), Trend Micro and Sophos. For this, as many as 6 points were awarded. 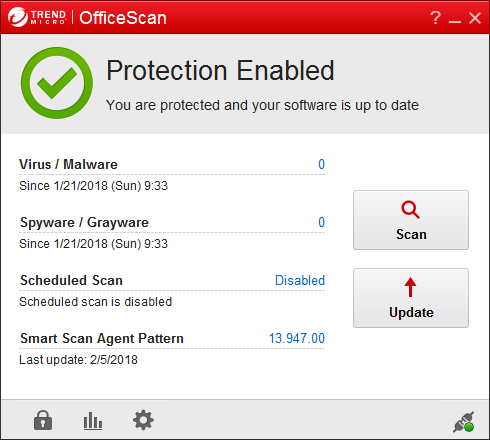 The products from Avast, Bitdefender (both versions), Ensilo und Microsoft quarantined between 6 and 8 files. Seqrite, G Data, Palo Alto Networks wrongly detected 10 to 15 files; F-Secure 23 files. In this test, the lab awarded the TOP PRODUCT rating a total of 6 times. With 18 points, this rating was given to both Kaspersky versions, Symantec Endpoint Protection Cloud and Trend Micro. Also recognized with 17.5 points were the solutions Bitdefender Endpoint Security and Symantec Endpoint Protection. Likewise, the products tested achieved good scores, earning 17 to 16 points: Avast, McAfee, Microsoft, Ensilo, Seqrite, Sophos and Bitdefender Endpoint Security Elite. It is worth noting that the solutions from Avast, McAfee, Microsoft and Bitdefender Endpoint Security Elite each received 6 points for protection. In the lower field are G Data, F-Secure and Palo Alto Networks. In particular, F-Secure could easily score higher, because the tested protection was error-free; only the false positives are too high. Windows 7 had a persistent staying power in corporations. But now a change is at hand. The Windows 10 share is climbing upward in the direction of 60 percent in Europe and in the United States. Windows 7 will soon decline below the 30-percent mark. It took some time, but now Windows 10 has arrived among corporate users in Europe and the United States. Only in a worldwide comparison is the share of Windows 7 and also 8.1 somewhat higher than Version 10. The fact that Windows 10 has now been able to so strongly increase its shares may be due to the low licensing fees. Perhaps another precipitating event was the ransomware crisis with WannaCry, which did not work under Windows 10, such that no infections occurred. Perhaps the fact that support for Windows 7 is ending in the year 2020 has also caused companies to reconsider. It is probably the sum of events causing Windows 10 to be adopted by companies in droves. 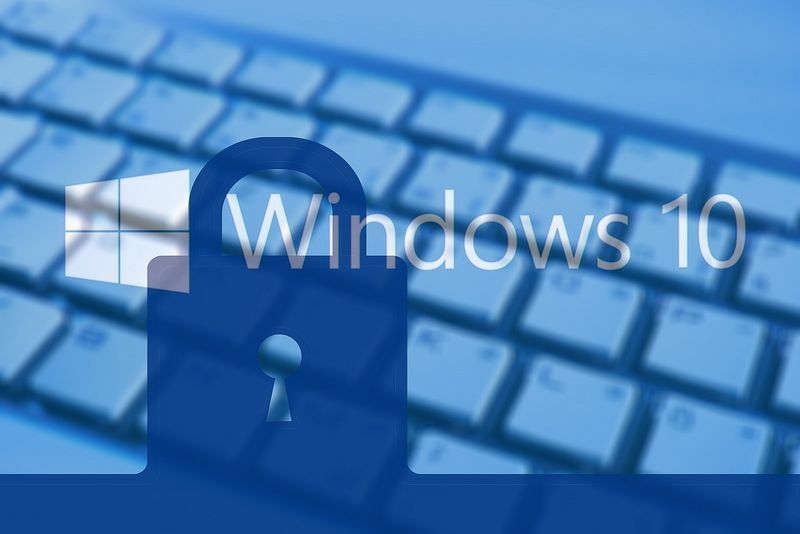 It is certain that the modified operating system structure and new security mechanisms protect Windows 10 more effectively. The update frequency is significantly higher on Version 10 than for old versions. The number of malware and exploits continues to increase for Windows 10 as well, however.